Stereo Soul and DJ Koncept have become the fourth act to confirm publicly they have submitted an entry for the 2018 Eurovision Greek final. Their electro-pop ballad will be adding variety as the other acts known so far had described their entries as having traditional elements. As reported earlier, the Greek public broadcaster ERT has contacted record labels in regard to putting together a national final for Eurovision 2018. Areti Ketime, Panagiotis Tsakalakos and Vasiliki Stefanou have already publicly confirmed that they have submitted songs. Today, it became known that male duo Stereo Soul have joined the race with a song created by successful Greek music producer and performer DJ Koncept – their collaboration will be backed by label Heaven Music. We have today submitted our song to ERT and we hope that we will be given the chance to present it to the Greek audience, who will also decide if, after all, our proposition is the one that can win over the musical tastes and the hearts of the whole of Europe. We created this song with love and passion. Even though it was initially all in English, respecting the specifications of ERT, we recorded again with Greek lyrics, too. It is a sensitive song with a dynamic character and interpretation by the two wonderful voices of Panagiotis and Bradley, known to the people as Stereo Soul. DJ Koncept, composer and producer of the entry. The song is an atmospheric mid-/uptempo electronic pop ballad, very melodic though not slow, with a modern sound and love-themed lyrics-wise, with a very beautiful, allegorical use of language. In terms of production, it is electric sound combined with synths and strings in the background and massive backing vocals during the chorus that are also recorded by us. We hope that we will be allowed to present it to you live, irrespective of which candidate will finally represent us in Lisbon because, more than anything, we believe that it is a strong song of this genre, which would allow our vocal ability to show during its live performance, and, on top of that, has potential for a very impressive onstage presentation. We are therefore hoping and keeping positive that ERT will offer us this chance. Panagiotis Pallis, one half of Stereo Soul. Both Stereo Soul and DJ Koncept have previously shown interest in representing Greece in the Eurovision Song Contest. This year, both acts had (separately) contacted ERT expressing their wish. However, in the end, the broadcaster decided to go with Demy and hold a final in order to select her entry among three songs composed by Eurovision veteran Dimitris Kontopoulos (Belarus 2007, Ukraine 2008, Greece 2009 & 2017, Azerbaijan 2013, Russia 2014 & 2016). 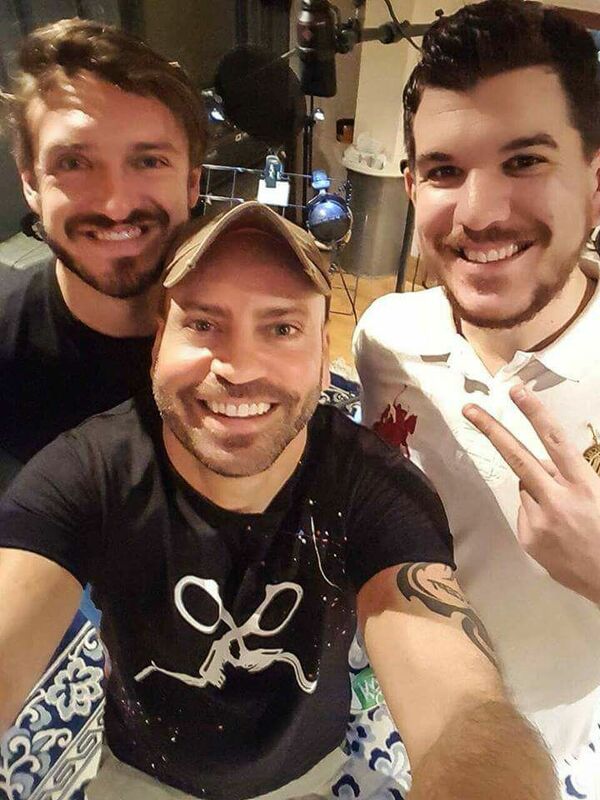 Stereo Soul (Bradley White-Dale and Panagiotis Pallis) and DJ Koncept (Kostas Papadouris) in the studio last week. The description of their song for 2018 – electro-pop sound and some English lyrics – hints that the initial stipulation by the ERT that the song ought to be sung in Greek and, preferably, have traditional elements may have been relaxed. Provided that ERT’s plans go ahead as expected, this is probably a good thing as it will provide the Greek audience with a wider variety of choice. The deadline for submitting entries to ERT is tomorrow, 20th October. In the following video, you can listen to Stereo Soul’s cover version of Orkisou (Swear), a song originally sung by former Eurovision entrant Alexia Vassiliou (Cyprus 1987). Do you think that the duo would be a good choice for Lisbon? Tell us what you think in the comments below.